hotel | What's YOUR Ghost Story? What about the beautiful town of Sault Ste Marie, MI? Is it haunted? If it’s appearing on this site, the odds are, yes. Michigan’s oldest town (founded in 1668!) and site of the Michigan ParaCon, Sault Ste. Marie (pronounced “Soo Saint Marie”) has some haunted locations. We’ll start right where we get most of our food while we’re on location, the 1903-built Palace Saloon. This restaurant has activity throughout the building including activity from the basement to the top floor, but most notably, a man in black seen sitting in one of the booths (pictured above). See a video I shot of employees talking about the hauntings with Mike, Wendy and Allison from the “See You on the Other Side” podcast. Sugar Island – Just 4 miles and a ferry ride away from the town center, this is a 49 square mile island with a population of under 700 people and is considered an ancestral homeland to the Sault Tribe of Chippewa Indians while also being important to the Ojibwe. It was once in consideration (in 1945) to be the HQ of the United Nations. 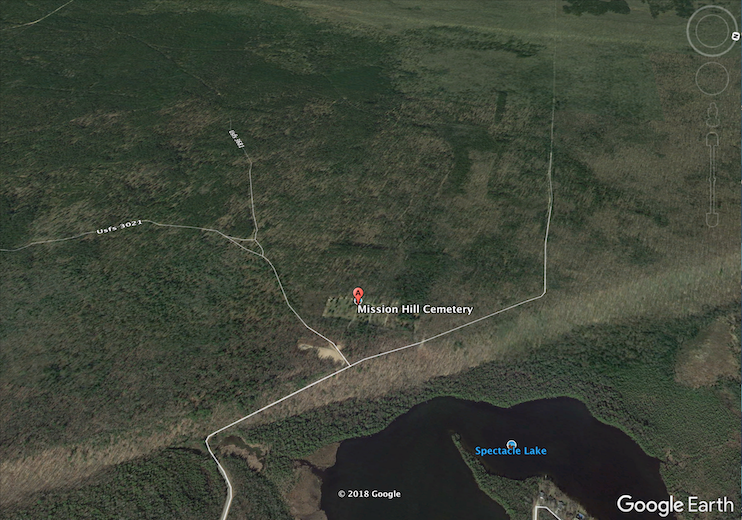 Mission Hill – about 22 miles west is the township of Brimley / Bay Mills and its secluded (click on the map to see just how isolated it is) and active Mission Hill Cemetery. This location is known for its abundant ghost lights and disembodied voices. This is possibly primarily a native American burial site. Due to its seclusion, there has not been a lot reported on it, historical or paranormal. Green Sky Hill – As tends to be the case with Native American legends, so much oral tradition is just that – only oral, not recorded in print. We were told to look into Green Sky Hill, about 100 south, in the main “mitten” of Michigan. Indeed, there is a book titled “Legends of Green Sky Hill” and categorized as “North American Indian Legends,” but the book was published in 1959 and little else can be found online. A journey into the world of used books may be needed to understand this site. Charlevoix – in the same area as Green Sky Hill is the town of Charlevoix. Like all of this region, inhabitation dates into prehistory by tribes of this region and, as the name indicates, French explorers in the 1700s. More modern establishments sprang up in the mid 1850s and by today we have a very old town with lots of ghost stories, particularly the Weathervane Restaurant that boasts three different ghosts who make their presence visually known. One specter moves objects… big objects… like slamming heavy doors and even rolling a large banquet table from one room to the next. Wolverine Hotel – Also near Charlevoix is the town of Boyne City, which boasts the Wolverine Hotel (pictured below, more recently known as the Dilworth Inn), a grand hotel from 1912. Unfortunately, I could not find any tales of hauntings at this site, nor could I even find if this location is open for business. Still, the fact that we were informed that this is a place to look into, tells us to pay attention. So, we’ll keep our eyes open for this site and others! 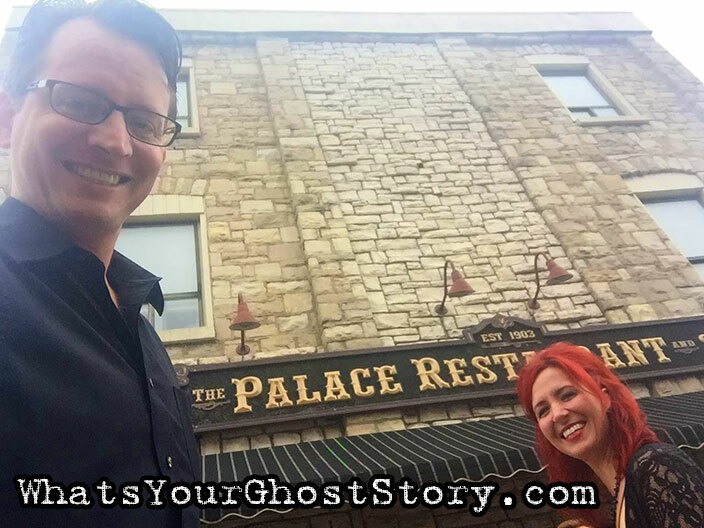 Locations within Sault Ste Marie that are reportedly haunted include the Soo Brewing Company, Antlers Restaurant, Museum Ship Valley Camp, Ramada Ojibway Plaza, The Satisfied Frog Pub, which is located just across the street from the Palace Saloon. More than anything, this article is a call to action for anyone out there. Do you have tips on interesting history, folklore or your very own personal ghost stories about these locations? Please let me know in the comments. Hopefully we can arrange a separate journey to the northern edge of America to further investigate these sites. The festivities kicked off with an evening tour of some of the more historic and haunted sites around northern Illinois, which I was invited to co-host along with author Ursula Bielski and archeologist Dan Melone. (Pictures, clockwise from top, left: Scott Markus speaking at the Dead of Winter Event, Dan Melone & Ursula Bielski speaking during the tour, Melone and Allison Jornlin of Milwaukee Ghosts attempting a psychic experiment, Markus with Wendy Lynn Staats of the “See You on the Other Side” podcast). Highlights from the tour have to include going to the Mineola Resort and the Stickney House (which we covered in our first newsletter, viewable here). It’s always fun to take people to haunted place to be able to tell the history and legends of a place while on site. It’s even more important to take people to places like this when they are endangered. There is perhaps no historic location in the US more endangered than the Minneola. The building, constructed in 1884 is the largest surviving wood frame structure in Illinois. While the site is constantly associated with Al Capone as he visited the site on numerous occasions in the ‘20s, it was already an uproarious location decades earlier, around the turn of the century. As Chicago was trying to clean up the vice-riddled levee district, Fox Lake became the lawless frontier. Nearly all of the resorts were stocked with slot machines and you just know there was little to no enforcement of prohibition laws. In fact, the last of the slot machines didn’t leave the building until a raid in 1952. According to a Chicago Tribune article (cited here), the Mineola was the “most vicious resort” in this burg of depravity. One can only imagine the stories and characters surrounding the long past of this site. Can you imagine the residual energy left behind from a place like this? What phantom sounds and echoes through time are continuing to clutter up the massive structure? 1930 saw the Fox Lake massacre unfold at Manning’s Hotel, likely a retaliatory attack after the St. Valentine’s Day massacre that resulted in five mobsters shot and three dead. Interestingly enough both Al Capone and his rival, Bugs Moran, had homes on Bluff Lake, a mere seven miles from the Mineola. There are legends of a ghost boy seen at the Mineola, reported by staff. However, possible activity throughout the building has been largely unobserved. Over the years more and more of the building became off limits as demand waned. The 100 hotel rooms have been closed off to the public since 1963. After 50 years of neglect, the elements took their toll. The domed ballroom collapsed in the ‘80s. By 2012 the restaurant/bar and banquet hall was the only corner of the building still in operation when the building was abruptly condemned. A 2013 survey of the building showed the the core structure was still strong and therefore salvageable. However, each passing storm inches this structure closer to obscurity. There is an organization in place that’s trying to save the site, which is on the National Register of Historic places. To lend your support and offer to get involved, check out their Facebook here. As is the case with most visits to the site, we were quickly approached by police officers. While we weren’t trespassing (we were walking around the building, staying on the road, as opposed to walking on the porch or attempting to enter the building), we were told to kindly be on our way and there was no further incident. Be advised, if you are to visit this site, do so respectfully and get ready to have someone checking in on you in short order. If you’re not doing anything wrong, you won’t have anything to hide. If you are thinking of breaking in, you will be stopped. The building itself if condemned after all, meaning it’s unsafe to enter. Of course, damage to the building itself is also a real concern as we all hold out hope that this structure will live long enough for there to be a chance for a comeback with a new, well-funded owner. Additional recommended reading, including a couple pictures of the interior can be found here at the NW Herald Website.